The event happened from 10 a.m.to 5 p.m. @ Speedway Meadow, JFK Dr. at 24th Ave., Golden Gate Park, S.F. 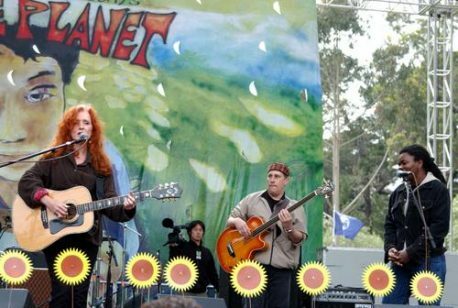 We the Planet, a festival of “music, consciousness and activism,” practices what it preaches by powering its event entirely with green energy sources (such as solar, wind, and biofuel), and printing tickets and posters on tree-free papers. The festivities are littered only by recyclable or compostable materials – not to mention packed with talks by celebrity activists such as Woody Harrelson and Flea. 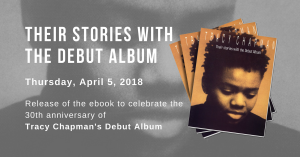 Hosted by Julia Butterfly Hill, the proceeds benefit her Circle of Life organization, but the real reason to attend was the killer musical lineup, which featured Cake, Bonnie Raitt, Alanis Morissette, De La Soul, Concrete Blonde, and the Coup. It’s a cloudy yet sunny Sunday afternoon at the Speedway Meadow in Golden Gate Park. Thanks to a fantastic sound system, the band playing can be heard throughout the park. The smells of vegan/vegetarian food such as spinach knishes and black bean soy cheese burritos fill the air. Non-profit vendors circle the meadow, giving away stickers and buttons, protesting the war. No, this isn’t the ’60s and this isn’t Woodstock. 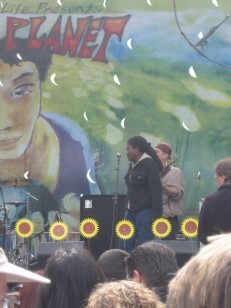 It’s the We the Planet festival held on Easter Sunday in San Francisco. We the Planet, advertised as “a day of consciousness, activism, and awareness” on flyers that were tree-free and printed with soy ink, was presented by Circle of Life. Circle of Life, the organization started by activist Julia Butterfly Hill, encouraged attendees to ride their bikes and take public transportation. “This plastic cup is made of vegetable starch,” said Butterfly, holding up the cup to a seemingly amazed and impressed audience. Butterfly served as emcee in between performances and guest speakers, amidst her cheesy remarks the hyper, enthusiastic host also imparted bits of awareness to attendees. First up to perform was Concrete Blonde, who played to a not so full audience. Doors opened at 10 a.m., but the festival wasn’t quite in full swing until about noon, when De La Soul performed. De La Soul played to a very full, excited audience, performing favorites like “Saturday” and “Me, Myself, and I.” De La Soul brought back old school hip hop, finishing up their set with a message to mainstream bling bling rappers, who glorify the violent, gangster life. Pasemaster Mace accused those rappers of sending the wrong message to our children. “You may have had that life before, but you sure as hell don’t live that life now,” he said. He then thanked the audience, and let them know that hip hop is not just for African Americans. “You don’t have to go to jail to be a part of hip hop culture—and you don’t have to be black to be a part of hip hop culture,” he said. During “Ironic,” she improvised a line, singing, “It’s meeting the man of my dreams, and then meeting his beautiful husband,” to which the audience responded with cheers and laughter. Morissette’s performance was the highlight of the afternoon, and her voice has never sounded better, her pipes hitting each note so crisp and clear with each song. Bonnie Raitt stepped onto stage when the sun was gleaming and the air was warm. “The sun always shines down on Bonnie Raitt,” said attendee Ken Wilkins, 33. Easter Sunday’s We the Planet concert in San Francisco’s Golden Gate Park felt more like an intimate family gathering than a large-scale outdoor festival. Featuring performances by outspoken artists like Alanis Morissette, Cake, Bonnie Raitt, De La Soul, Concrete Blonde and the Coup, the event, hosted by environmental activist Julia Butterfly Hill and produced by her Circle of Life organization, raised awareness about how individuals can help sustain Earth’s natural resources. Practicing what it preached, the concert was powered entirely by solar and bio-diesel power. And Hill promised from stage that any emissions created by the transportation of the artists to the show were being “given back” to the environment through wind generated power delivered “back to the grid.” And all of the artists and speakers donated their time. 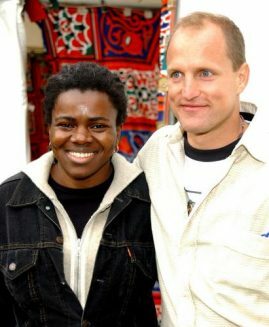 Hill’s celebrity friends, including Woody Harrelson and Flea, testified to the crowd about how little things can make a big difference. Flea talked about how the Chili Peppers’ decision a year ago to use tree-free products to develop the packaging for By the Way created a ripple effect, to the point where Warner Bros. Records has agreed to only use tree-free products in all CD packaging moving forward. “27,000 tons of paper pulp was saved this year by Warner Bros. action,” Flea reported to cheers. Cake got the crowd back on its feet. Vocalist John McCrea led sing-alongs of “Sheep Go to Heaven” and the apt “Rock ‘n’ Roll Lifestyle,” where the lyric “excess ain’t rebellion” was not lost on the crowd. Toning down his usually caustic rhetoric a few notches, Coup frontman Boots Riley closed the show leading a live funk band through its paces as he spewed out raps including “5 Million Ways to Kill a CEO.” Riley and second MC E-Roc got the crowd — and their fellow performers — pogoing along to a funky rhythm: A look stage left revealed Raitt grooving, a look stage right had Joan Baez waving her hands in the air like she just didn’t care. It was just that kind of afternoon in Golden Gate Park. Earth Day festivities are underway in San Francisco. 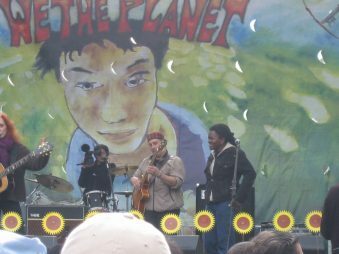 The We The Planet festival is set for April 20 at Speedway Meadow in Golden Gate Park. There will be music, speakers and on-site demonstrations of conservation efforts. Alanis Morissette, Bonnie Raitt (in a special acoustic performance), Cake, Concrete Blonde, The Coup, and De La Soul are confirmed artists on the bill, with additional performers expected to be announced. Also taking the stage are several speakers, including festival organizer Julia Butterfly Hill of Circle Of Life, Van Jones, Randy Hayes and Spoken Word by Youth Speaks. Billed as a sustainable event, We The Planet is putting its words in action by showing how it’s using green energy, recycling, compost and environmentally friendly promotional materials. As an example, the staging and sound production will be powered by bio-diesel fuel in standard generators. Tickets are $15 in advance and $20 at the door. VIP tabs run from $100 – $300 and include goodies such as a reception with the artists, special entry, vegetarian hors d’oeuvres and a gift, depending on level purchased. Looking ahead to the fall, We The Planet is taking the show on the road, visiting colleges, communities and political hot spots. The crew will travel across country – beginning in Northern California and circling the States – for two months in veggie-oil and bio diesel-fueled vehicles, with solar panels and eco-friendly interiors. There will be approximately 30 artists, with Patch Adams, Krist Novoselic (of Nirvana), Jello Biafra, Alicia Silverstone, Jan Jones, Ed Begley Jr., Woody Harrelson, Michael Kang (String Cheese Incident) and others expected to perform. Check out www.wetheplanet.org for the low-down. 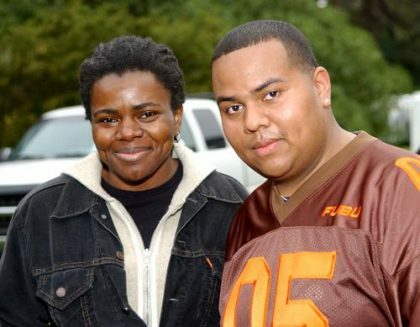 Cake, De La Soul, and others join for a outdoor concert in San Francisco. 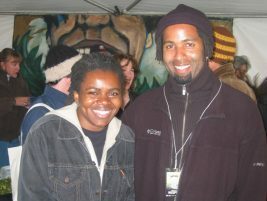 March 10, 2003 – Circle Of Life, a bay area-based non-profit founded by activist and author Julia Butterfly Hill, is presenting the first We The Planet festival on April 20, 2003 at Golden Gate Park1s Speedway Meadows with performances by: Cake, De La Soul, Concrete Blonde, The Coup & an acoustic set by Bonnie Raitt. The concert event will be powered by green energy sources (including bio-fuel and solar power)and will model sustainability on every level of production and implementation. Organizers are working with all food & commercial vendors to ensure all food service items, handouts, and promotional materials are compostable or recyclable in order to minimize the flow of trash into the waste stream. Additionally they asking festival go-ers to bring their own reusable plate, cup, & utensils and offering a chance to win prizes for those who do. The SF Bicycle Coalition will provide free secure bike valet, and all tickets & posters are printed on tree-free paper made of hemp/flax/PCW, provided by the Living Tree Paper Company. Representing the diverse nature of the community are bands which appeal to people of all walks of life. From The Coup’s political hip hop, to Bonnie Raitt’s world class blues and social activism, We The Planet offers something for everyone.In addition, the festival will feature speakers, spoken word, interactive and educational displays, responsible businesses, art, organic vegetarian cuisine, recycling, composting and waste reduction policies. 25 local and regional non profit organizations will be on hand to connect with attendees, and Cliff Bar has signed on as one of the sponsors. “We all know we live in a world full of problems, We The Planet aims to show that we also live in a world full of solutions. I am deeply grateful to all of the bands who have donated their time, enabling us to offer the community a fun and educational day in the park, at such a low ticket price,” remarked Julia Butterfly. While April 20th, 2003 marks the first-ever We The Planet festival, there are more to come. In the Fall, We The Planet will launch a 2 month long bio-diesel powered tour across America. Any funds raised at this WTP event, or the Fall tour, will benefit Circle Of Life, which was founded by Julia Butterfly Hill in 1999. 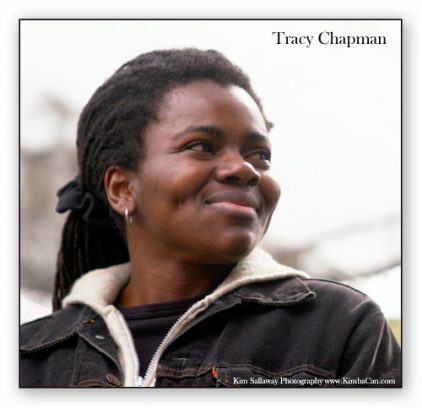 The organization continues to provide a spiritually grounded, enthusiastic voice to a new generation of environmental activism. For more information, please visit www.wetheplanet.org. We The Planet is being produced by The Spitfire Agency, which is a full service production, promotion & marketing agency dedicated to non-profits, responsible brands, and other activist related ventures. What time:The doors open at 10 AM and music begins at 11AM and goes until 5pm. Where:It all takes place at Golden Gate Park’s Speedway Meadow. www.wetheplanet.org for SF retail locations. Additionally, 2,000 free tickets will be distributed to low income persons and community volunteers through Bay Area non profit organizations.